Kali Quinn travelled to Guatelmala and El Salvador as a Clowns Without Borders volunteer in 2010. She has since been teaching, performing, creating theater with people across the US, and recently she recently released a new book called I am Compassionate Creativity. Through 111 stories from her life that look at her relationship to strangers, elders, grief, love, medicine, technology and play, she shares 111 values of Compassionate Creativity. “When electing to travel with Clowns Without Borders, you enter into places ravaged by natural disaster or torn to pieces by war. Traveling down these roads, you see such hardship repeated upon the faces of the people. Homeless, hungry, hurt. Such grief affecting all people. A devastation and loss so much more vast and real than would ever be reported in the news. How could you, now witnessing it firsthand, ever have the words to explain this to someone who wasn’t there? How would you even start? How could you possibly find a way to get onto the next plane home and move on to have a conversation about anything else other than this? So you get out of your vehicle and walk down the streets. You realize that the city or town might have been destroyed and many of its inhabitants might be missing, but at the same time there are people, individuals, there. Alive. Standing on the line between life and death, a sense of community can’t help but linger in the air. A mother feeds a child. Two men lift up boards. Children tickle one another in the dirt. There is a want to be together. Laughing. Listening to music. Celebrating something. Anything. Your colorful clothes and red nose set you apart and draw a crowd, but that isn’t what keeps them watching. It’s the continual surprise of being in the presence. A performance based on being affected by every sound, movement, and pebble placed on the ground. Everything an offering, an opportunity, for play. A universal laughter erupts when you unexpectedly trip over your own foot and end up being okay. All of your actions illuminate again and again a buoyancy that we all love to watch. A resilience that we all long to somehow find our own capacity for. A kindred spirit who simultaneously embodies qualities that everyone recognizes: the innocence of a child, the gut of a dog, and the wisdom of an elder. After the street performance, a young boy runs up to you and tugs on your shirt. Translated, he asks if when you get to the next town, you could please help his cousins put a violin together. They’ve been wanting to learn how to play but only had the pieces of the instrument, sent long ago by mail. In the next place, deep in the jungle, you give your final performance. Afterward, a small family of three generations comes up to you and offers up a violin case cradled in their arms. “Yes,” you nod, remembering the boy who had wanted you to meet them. To help them put it together. You move together to a nearby pavilion and through joy and anticipation they open the case. How long had these pieces been waiting in their home? You cradle the new instrument in your arms as they hand you one peg and string after another until they are all balanced along the bridge. You pluck the strings into tune as the family claps and claps in amazement. You imagine the place across the world where the violin must have come from. You remembered your first violin teacher back home. You remember your fear in saying yes to this trip. The afternoon sun beams to the song of a child’s smile as he places the bow along the strings for the first time, his family suspended in pure delight. 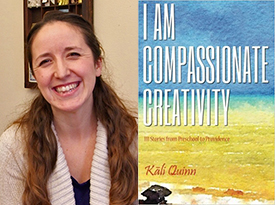 You can read more about Kali, donate to her cross-country reading tour, and order her book, I am Compassionate Creativity, here: www.compassionatecreativity.com.